It’s a big deal in our household every year when we get to use the barbecue for the first time. This spring it was a little later than usual because of snow accumulation that stubbornly refuses to melt. To access the grills I had to shovel about two feet of snow and ice off of the deck, and then wait another few days for the last of the ice to melt. There are still a few patches in the shade that I chipped away at today to free the tarps and covers. As you can see, the snow level is still pretty darned high in the yard, higher than our raised deck in a number of places (although the deck is only raised at max two feet off of the ground). It’s all compressed ice and granular snow now, none of the fluffy, powdery snow that makes winter so much fun. 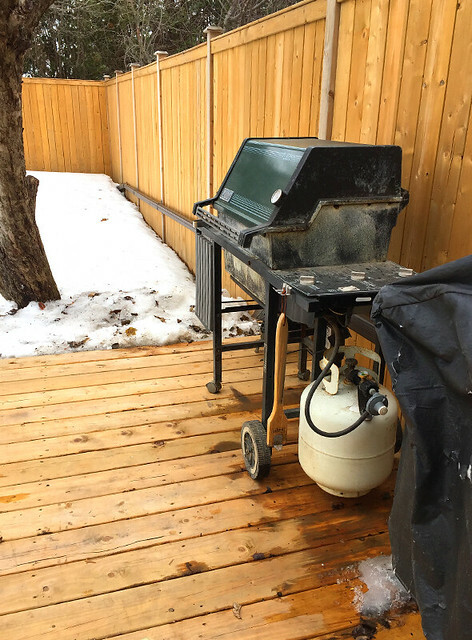 I was kind of hoping to get the wood pellet barbecue out and running yesterday, as it’s definitely the nicer of the two barbecues, but although it has been freed of the ice, its fuel is stored in the shed which is still behind a pretty significant drift. (I’m really looking forward to that area melting because it would also mean regaining access to our bikes.) So I had to use the gas barbecue, although I wasn’t sure how much fuel was left in the tank. Not much, as it turned out, but just enough to cook up a few hot dogs. 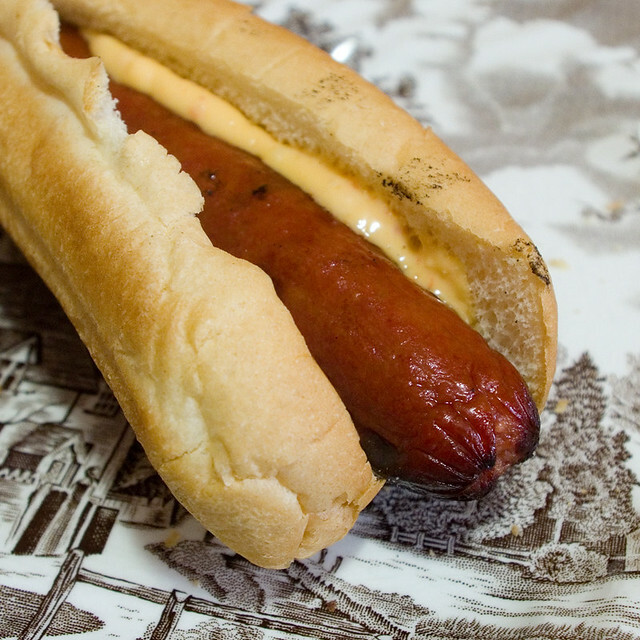 Nothing fancy about these hot dogs; they’re just Kirkland weiners on Old Mill buns. On my bun there’s also a squirt of Culinary Treasures Jalapeño Lime Aioli, which I think is the best hot dog and burger topping since ketchup. Honestly, it was a lot more work to obtain access to the barbecue and test it out than it was to actually cook today’s supper. (Although the kids couldn’t have been happier.) But I don’t mind because hopefully this will lead to a whole lot of other meals cooked outdoors during the warmer months. I’m looking forward to barbecuing pork belly that doesn’t end up like charcoal. But I probably won’t be trying today, though, because it’s supposed to rain all day. Or possibly snow. Or both. Thus is spring.